An Englishman in Colombia: Bling Display! I can't tell you how good it felt, there has been no sign of a cement mixer today, and I gave my last sack of cement to a neighbour, and back into the workshop. SWMBO wanted a portable Bling Display, she has two online Companies, but with Colombia being years behind everyone else, many don't trust Internet purchases here, so she still has to go out and take part in Bazaars. One company sells fashion accessories (Bling!) but other than laying it out on a table, she had no way to display goods. From Homecentre I bought a 4' x 4' 3mm plywood, it had been cut down, having been damaged, that was $2-85, I also used a length of 2x4 which I had in stock. The plywood I cut down to two pieces 18" x 42", and the 2 x4 I cut down to lengths of 3/4" square, on the table saw, and then thicknesser. It was then a case of assembling the jigsaw. 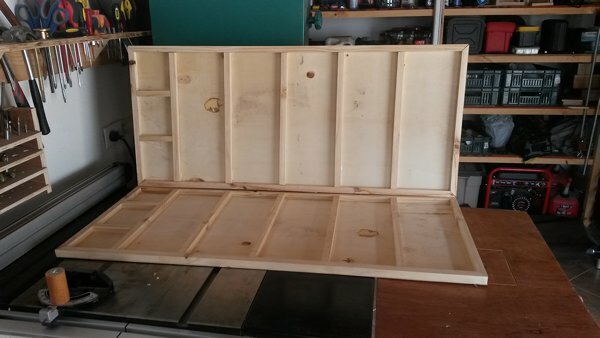 I used glue and brad nails to put it together, I now need to get a piano hinge, but doubt I'll find one here, so will use four small hinges to join the two panels, two lengths of chain to support the open panel, cut an old leather belt to make a handle, and finally a catch to keep it closed, when being transported. A couple of coats of varnish, and SWMBO is going to line the individual panels with material, attached with spray glue, hopefully she will then be ready for the next bazaar!